Codling moth (CM) -- 1st generation, first sustained trap catch biofix date: May 20, Tuesday. Codling moth development as of May 27: 1st adult emergence at 7% and 1st generation egg hatch at 0%. In most orchards, insecticide targetted against plum curculio and apple maggot prevent codling moth damage. If targetted codling moth control is needed, key management dates are shown here: 1st generation 3% CM egg hatch: June 11, Wednesday = target date for first spray where multiple sprays needed to control 1st generation CM. Lesser Apple Worm (LAW) -- 1st LAW flight begins around: May 16, Friday; Peak trap catch: May 26. Obliquebanded leafroller (OBLR) -- 1st generation OBLR flight begins around: June 12, Thursday. Oriental fruit moth (OFM) -- 1st generation OFM fligth starts: May 9, Friday; 1st generation 55% egg hatch and first treatment date, if needed: June 1, Sunday. Plum curculio (PC) -- Increase risk of PC damage as McIntosh and similar cultivars increase fruit size: May 26, Monday; Earliest safe date for last PC insecticide spray: June 3, Tuesday. San Jose scale (SJS) -- First adult SJS caught on trap: May 25, Sunday; 1st generation SJS crawlers appear: June 22, Sunday. Spotted tentiform leafminer (STLM) -- 1st STLM flight, peak trap catch: May 16, Friday. 1st generation sapfeeding mines start showing: May 24, Saturday. Optimum sample date is around Monday, May 26, when a larger portion of the mines are visible. Believe it or not, we have had seven primary apple scab infection periods to date at the UMass Cold Spring Orchard. Primary scab here is pretty much over, however, maintain fungicide coverage for the next 1-2 wetting events, depending on how confident you are you have primary scab under control. Knock on wood, but, we have yet to find any scab here at Belchertown -- but I know it is probably too good to be true. Fire blight risk is marginally up -- if you have open bloom on susceptible cultivars and/or a history of fire blight in your orchard, I suspect a streptomycin spray is going to be in order for today or tomorrow. Check NEWA for your location. The possibility of hail is also in the forecast -- streptomycin should be applied as soon after a hail event as possible IF you have recent history of fire blight in your orchard. Plum curculio are going to be active as fruit size increases. Ho hum, I suspect most growers have or are applying a petal fall insecticide. I will let you know when the danger of plum curculio damage has passed (at Belchertown). Apple fruit thinning would be the main topic of interest this week. Boy, kind of ho hum again. Nothing stands out. Everyone should be doing some chemical fruit thinning, at what we would propose would be a modest effort. Just remember, we rarely over-thin, so get out there and have at it. Don't forget the 2014 New England Tree Fruit Management Guide has extensive chemical thinning recommendations/specifics for many varieties -- don't hesitate to consult when looking at chemicals and rates. Also, NEWA has the Apple Carbohydrate Thinning model. (Go to http://newa.cornell.edu and look under the Crop Management drop-down menu for the ACT model.) Right now, Tuesday morning, the ACT model calls for using standard chemical thinner rate (today) and increase chemical thinner rate by 30% for tomorrow through Friday. (See below.) You need to consult the ACT model daily, as weather changes and the model recommendation may change. Apple scab update. The risk of primary scab infections has decreased significantly. Our spore traps caught very few ascospores over the last few days, indicating that in orchards primary season is over. A few spores may be available in high inoculum areas, such as abandoned trees or areas with bad scab last year. This is a good time to look for scab. By the end of the week, any infections from most of this seasons infection periods will have had time to develop into visible scab on leaves. Now that the high-risk period for scab is over, maintain fungicide protection with an EBDC, captan or a combination. Powdery mildew. Powdery mildew has started to show up. If you’re seeing it, fungicide applications can stop mildew growth and suppress spore production. While these established infections will stay around for this year, regular fungicide applications through to terminal bud set or at least second cover will prevent them from infecting new growth and reduce problems next season. The best mildew fungicides are the DMIs (SIs), and of these Topguard, Tebuzol, Vintage and Rally work best. The QoIs (strobilurins), Sovran and Flint, also work well on mildew, as does the SDHI Fontelis. Remember with Fontelis to be aware to avoid mixing with captan. Now may also be a good time to consider using a pre-mix that will work against both scab and powdery mildew. Luna Sensation and Merivon both contain an SDHI and a strobilurin, and will work well against both diseases. Remember to include a protectant with any of any of the DMIs, QoIs, SDHIs or pre-mixes to reduce the risk of resistance development. Fruit are or soon will enter the main chemical thinning period (the 7 to 14 mm stage) when fruit are most vulnerable to thinners and when the majority of chemical thinning is done. Variable bloom was experienced in many orchards this spring and consequently there were questions at the time about fruit set and if there would be a sufficient fruit that would require thinning. When fruit reach 6 to 7 mm initial set can be assessed and now fruit growth have grown in most orchards to that size where set can be assessed and thinning decisions can be made. In general the weather since bloom has been moderate to cool and fruit have not been stressed. This usually means that a thinning program should be at least moderately aggressive to achieve significant thinning. The weather forecast for the next 5 days suggest that fruit will not be exposed to stressful conditions which might lead to a carbohydrate deficit, and if this forecast does not change fruit will have a carbohydrate excess. In circumstances such as this it may be prudent to select a thinning program that is more aggressive. I viewed all of my research plots in Belchertown this morning and decided to be more aggressive in my thinning program in all plots. When selecting a thinning program where you choose to be more aggressive it is often safer to use at least two thinners rather than increasing the concentration of one substantially. All thinners can be used during this time. 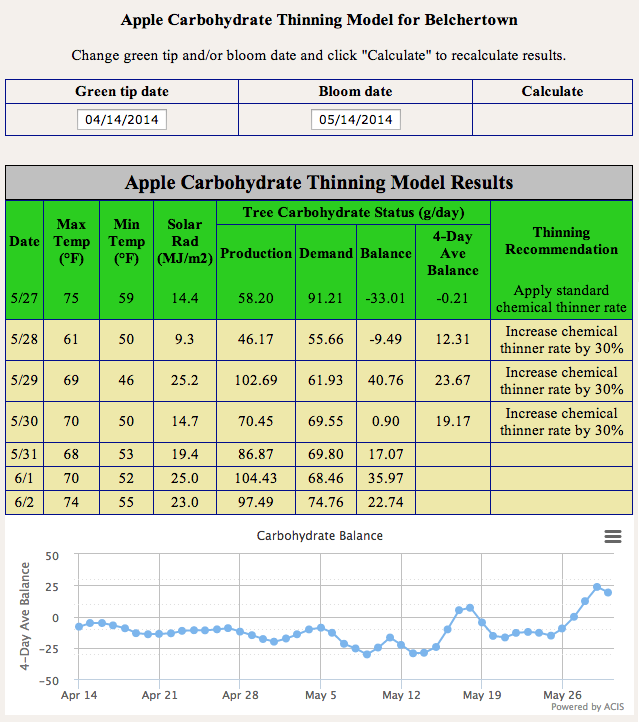 This may be a good year to test the thinning model (Predicting Fruitset Model and Predicting Fruitset Excel Spreadsheet) and measure fruit to determine thinner efficacy. Following application, it requires 3 to 4 days for a thinner to start to work. During the next 4 to 5 days, fruit that will abscise will slow growth. Frequently, a reduction in growth can be measured that can’t be determined by observing the growing fruit. Since it is forecast to be somewhat cool during this period it may take an extra day or two for fruit to respond to chemical thinner application. In years when fruit are not stresses from bloom to 15 mm it is frequently possible to thin fruit later in the season. I am definitely not suggesting that you procrastinate in making your thinner applications, but if the thinners that you apply this week do not work well, you may have another chance in a week to 10 days. Be prepared. The next Healthy Fruit will be published on Tuesday, June 3 or thereabouts, 2014. As always feel free to get in touch with any member of the UMass Fruit Team (http://extension.umass.edu/fruitadvisor/team-members) if you have questions or comments.